Turkish lawmakers cast their votes in the Turkish Parliament on Tuesday to push through first two articles of an amendment to the constitution in a historic vote that will bring the country closer to an executive presidency, expanding powers of current President Recep Tayyip Erdogan. In a session dogged by quarrels and bitter bickering a day before the voting, lawmakers pushed through a constitutional reform package that puts Turkey on the cusp of a regime change. The vote endowed with squabbles and accusations, igniting debates over ruling Justice and Development Party (AKP) deputies’ blunt defiance of the certain constitutional mandate over the secrecy of the voting. Backed by ruling AKP and opposition Nationalist Movement Party (MHP), the initial vote passed through Parliament on Monday, setting the stage for Tuesday’s voting as the government plans to complete the package vote by Jan. 24. In total, 338 deputies voted in favor the constitutional reform, while 134 voted against the bill. Of 550-member assembly, 480 joined the vote Monday night. There were abstentions or invalid votes, while some lawmakers were unable to attend the session as more than a dozen of People’s Democratic Party (HDP) deputies are in prison. The first vote was an indication of support for the bill, slightly passed through the threshold, at least 330, to bring it to a referendum. The ruling AKP has 316 votes eligible, while MHP has 39 seats in Parliament, means there were deputies from both parties did not vote in favor of the bill. On Tuesday, 347 voted in favor of the first article of the constitutional amendment about 9th article of constitution that regulates judicial affairs and how courts work. During the session, 132 came against the change in a vote joined by 484 deputies. Prime Minister Binali Yildirim tried to make a compelling argument for why Turkey needs an executive presidency at a speech delivered to lawmakers in Parliament ahead of the vote on Monday. He lamented about the current dual power structure in the executive branch and said the 18-article bill would resolve the confusion by establishing only one executive authority. “There needs to be one authority in the executive branch,” he said in Parliament, adding that “two captains sink the ship, there needs to be one captain.” He celebrated the result after Tuesday’s vote. The argument for one executive power has been in the making for years and reflects Erdogan’s long-running view about the executive branch. 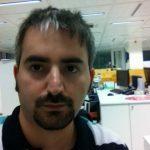 Another point that Erdogan and his supporters refer to make a compelling case to sell the executive presidency to people is the perceived need for a strong leadership and one source of executive power free of checks and balances system during the tumultuous period that Turkey is going through. The ruling party argues that coalition governments of 1990s condemned Turkey into a state of political instability, economic stagnation and a weakened regional position. For them, an executive presidency will also resolve disputes and potential feuds between president and prime minister by granting most of executive powers to the former in an effort to remove likely points of political clash. Erdogan often expressed lamentation and dismay about the subtle power struggle between two heads of the executive branch when he was the prime minister. At times, he and former President Abdullah Gul came closer to a political collision over a number of thorny issues that reflected the palpable differences between two politicians and personalities. But a soft-spoken and moderate figure during his tenure, President Gul did his best to avoid an all-out confrontation with Erdogan, and managed to solve potential crises by compromise, or going Erdogan’s way. When Erdogan ascended to the presidential seat in 2014, roles between the president and prime minister reversed. Normally, prime minister is the head of the executive branch, the government, and is responsible for governing the country. Erdogan who was ultra-sensitive against any semblance of interference or crossing line by the president into boundaries of his executive position as head of the government, turned the table upside down with his ascension to presidency. From the first day, when he was elected as president at first popular presidential election, on to today Erdogan made his intention crystal clear that he won’t satisfy with a symbolic position at the presidential palace in line with the constitutional provision. Erdogan’s larger-than-life persona and his vivid ambitions made maintaining a healthy relationship with Prime Minister Ahmet Davutoglu, who succeeded him after the presidential election, unpalatable and implausible. Erdogan’s refusal to remain above day-to-day politics and keeping constitutional commitment to impartiality was a well-known story since 2014. He simply rewrote the rules of the game and reversed the balance of power in favor of presidency, and acted as an executive president. An ever-growing rift and palpable differences between Davutoglu and Erdogan eventually brought two leaders to a collision, prompting Erdogan to ask resignation of the prime minister in May of last year in a move regarded by many as a ‘political coup’. Davutoglu’s not-too-subtle aversion and objection to the presidential system, his efforts to act independently of Erdogan’s grip over executive branch constituted the core of the dispute between the two. Simply, Davutoglu tried to become himself, rejecting a deferential role at prime ministry. But that was anathema to Erdogan and cost him dearly, his premiership. Prime Minister Binali Yildirim was chosen as a point man by Erdogan after Davutoglu to steer the country into the executive presidency. This week’s vote in Parliament about constitutional reform package comes against such background. 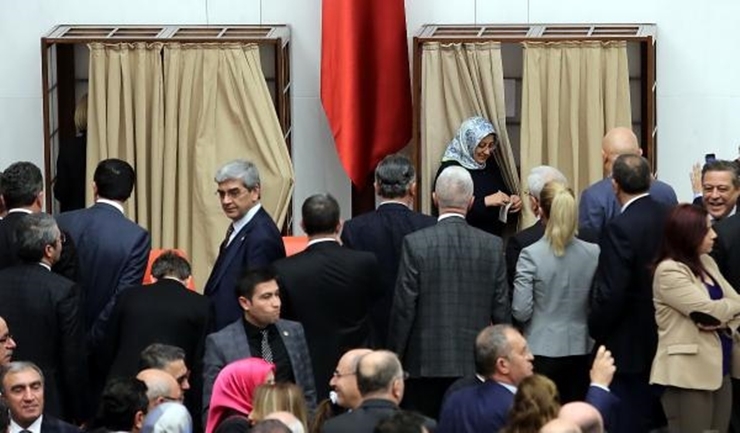 The parliamentary session generated squabbles after ruling AKP deputies blatantly defied a constitutional provision that requires lawmakers to cast their vote in closed booths. 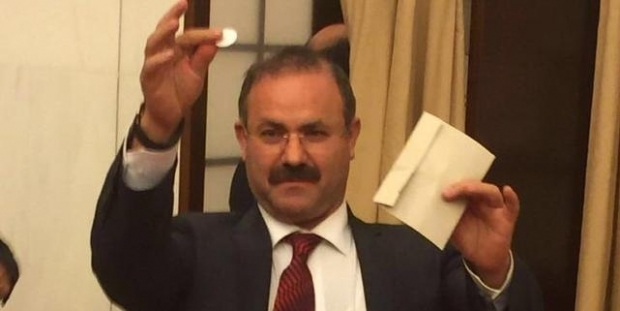 Health Minister Recep Akdag even did not enter a booth for voting, cast his vote in front of other lawmakers, igniting a fight with main opposition Republican People’s Party (CHP) deputies. 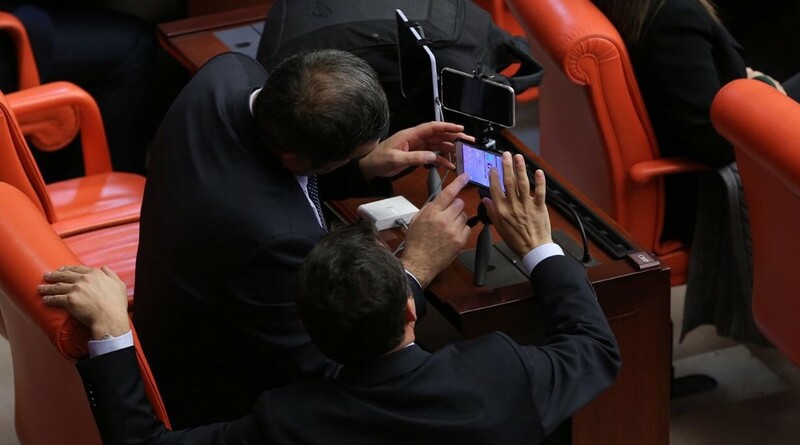 CHP members captured voting of AKP deputies with cellphones and broadcast the vote session on Periscope. “Why are you voting openly? You are committing a crime Mr. Minister,” CHP deputies challenged Akdag before he put his envelope into a box. “Yes, I’m committing a crime. Do I have to ask you? It is none of your business,” Akdag told CHP lawmakers. Part of the reason why AKP members cast their votes openly was their fear of being accused by other party fellows and President Erdogan over possible “No” votes among AKP deputies. To prove their loyalty and allegiance, they chose to defy constitution while voting. Every day Parliament will debate and vote parts of the 18-article bill until Jan. 24. If the whole package passes through Parliament, the government plans to hold a referendum in the spring.